Did the Austrian chancellor “hop on” the issue of water privatization to stimulate his election campaign in 2013? Privatization of water was one of the big issues in the media in 2013 – even in Austria, one of the water richest countries in Europe. But a closer look at media reports in Austria in the year 2013 shows that there wasn’t a public discourse about sustainability and the environmental dimension of water supply or the risk of scarcity, there wasn’t a discourse with arguments and counterarguments. Instead, privatization of water was the issue that dominated the media; and the candidate for chancellor (Werner Faymann, SPÖ) “hopped on” the issue of privatization, fueled by the largest newspaper in Austria, the Kronenzeitung. 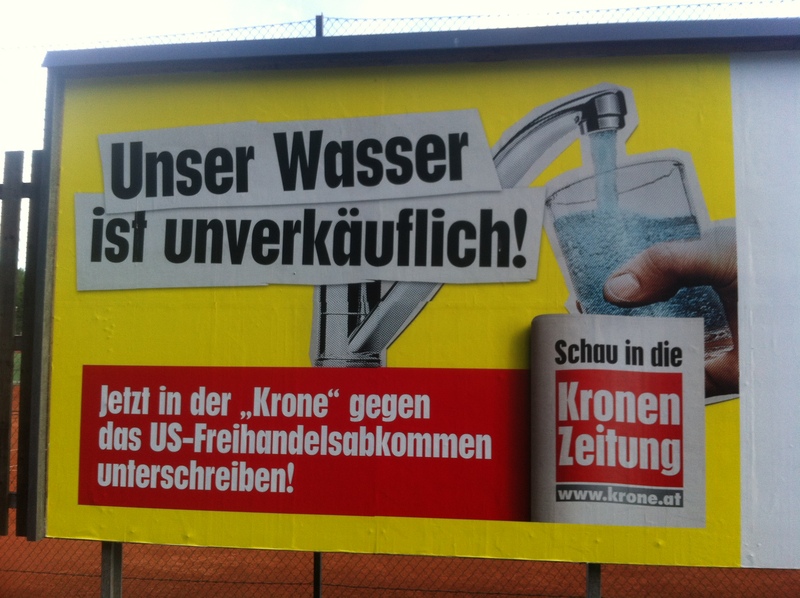 4 million readers (which is half of the Austrian population of 8 Mio) were confronted with incendiary headlines like “we don’t sell our water” (see photo) and letters in every newspaper to collect signatures against privatization. Thus, Werner Faymann had the perfect platform to communicate against privatization in his election campaign, the Kronenzeitung was the perfect media partner to “fall in love” with. In an increasingly media-driven society, the media have advanced their selection and evaluation skills in relation to the mass of information available. One of the main media services is to characterize a situation (an event, an occasion) as “controversial” (see news values research, i.e. Price & Tewksbury, 1997; Galtung & Ruge, 1965), to show that “public decisions are needed” (Melkote, 2009, p. 549). In this process, arguments and counterarguments, controversial frames are used to organize public communication and ensuing public discourses (Weder, 2015). The Austrian story seems to be a perfect example to discuss how much the media can steer a public discourse and how easy public discourses can be drawn to another field or be transformed into a political discourse if there is a lack of counterarguments and controversial frames. Faymann’s “media relationship” shows that public discourses can easily be “used” by politicians as well by business (-> reactive issue management) if there is only one line of argumentation (pro or con). In other words: if there aren’t arguments as well as counter arguments, if there is only a limited number of frames or the same frame published again and again in the media then the media partnership is just a “one night stand” and does not enable further communication with stable communication structures like in a long term partnership . The data I base my considerations on comes from a project about the “problematization of water supply & scarcity”, conducted at the University of Klagenfurt, Austria, Department of Media and Communication studies; the project seeks to identify the role of the media in enabling and restricting stakeholder engagement in determining sustainable water allocation (contact. Franzisca.Weder@aau.at). Here, 1516 articles related to the issue of water supply and scarcity in German, Austrian, Slovenian and Italian newspapers (national and regional; Dec. 2012-June 2013) were analyzed with a quantitative and qualitative media content analysis (Tool: Nvivo) to identify the water related discourses and the dominant voices. One of the most interesting results: all articles (n = 185) we found in the Kronenzeitung in Austria contain arguments against privatization; the main actors related to the negative frame “privatization is bad” were political parties (mainly the SPÖ) and the European Commission as political institution. The results confirm the theoretical implications that privatization is highly mediated as part of a political strategy and not related to a sustainability or at least environmental context; as well, the results show that the environmental discourse is transformed into a political discourse and stimulated by the media partnership with only one line of argumentation. Weder, Franzisca (2015): Framing of Corporate Social Responsibility in public discourse. Introduction and application of a new frame model to investigate CSR communication in the media. Journal of Business Ethics. Under 2nd revision.